On Sale Now! Free Shipping Included! Save 8% on the OFM 118-2-AA-801 Posture Series Task Chair with Arms by OFM at Momiji Studios. MPN: 118-2-AA-801. Hurry! Limited time offer. Offer valid only while supplies last. Looking for great back support? the OFM posture Series chair provides the flexibility and structure you need at your office, desk, or workspace. Looking for great back support? the OFM posture Series chair provides the flexibility and structure you need at your office, desk, or workspace. Perfect for all-day-long comfort, this chair features built-in lumbar support and adjustable back Height and pitch for precision comfort. 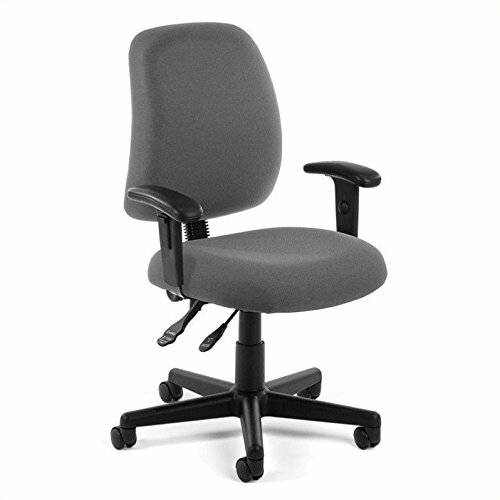 Seven-position adjustable arms and a gas-lift seat Height adjustment provide additional ergonomic customizability. Both seat and back are upholstered in high quality, easy to clean stain-resistant fabric rated to exceed 150, 000 double rubs so the chair stays looking its best even after heavy use. A sturdy wheeled 5-star base and 360-degree swivel make mobility easy. This 118-2-AA-801-OFM meets or exceeds industry standards for safety and durability, and is backed by OFM limited lifetime warranty.